incl. accessories, warranty card, manual, EC declaration of conformity, 2 years warranty on the boat, as well as all attachments, 5 years warranty on the boat skin. Pictures in onlineshop do also show the use of the past iBoat generations! Ideal for a bit or very much! Fast, manoeuvrable, light, small transport size but also enough internal space – those are the characteristics of the brand new iBoat 210. The 210 is as all iBoats made of extra solid Dezitex1100 and precisely joined by galling. It fits perfectly in the existing iBoat series and has all advantages of its elder brothers. All iBoats come with black paddle and solid aluminum seatbanks in black! Additional protecting rib on places that are especially claimed, indestructible oarlocks of metal with secure double bolting, no line-catchers (hooks, rings etc) extreme long and large internal space and plenty of accessories- here are our iBoats! The iBoat 210 is your ideal companion during short sessions, quick feeding or echo-sounder trips, always when you do not move with a lot of tackle or also as a second boat during big tour with BIG MOVE ACTION. Two big boats are often too much! 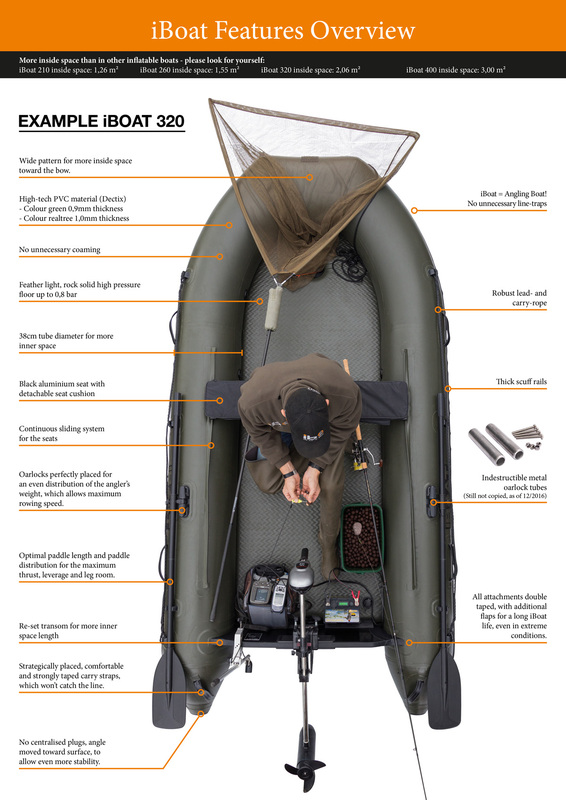 If you already have a 260 or 320 than the iBoat 210 is the ideal supplement! Move rapidly and stay on your course on the water, bring your baits on your hot spots with lightening speed and drill the carp securely out of the boat. On the iBoat 210 feed buckets, echo-sounder and unhooking mat for the captured fishes have easily enough space. Row comfortably with enough legroom. Especially here many boats of this length fail! Also with the iBoat 210 there is no randomization of the details- everything is perfectly elaborated! Mark Dörner: "The iboats of Imperial Fishing enjoy great popularity. It is no wonder because Imperial Fishing was the first company that developed rubber boats for carp fisher. 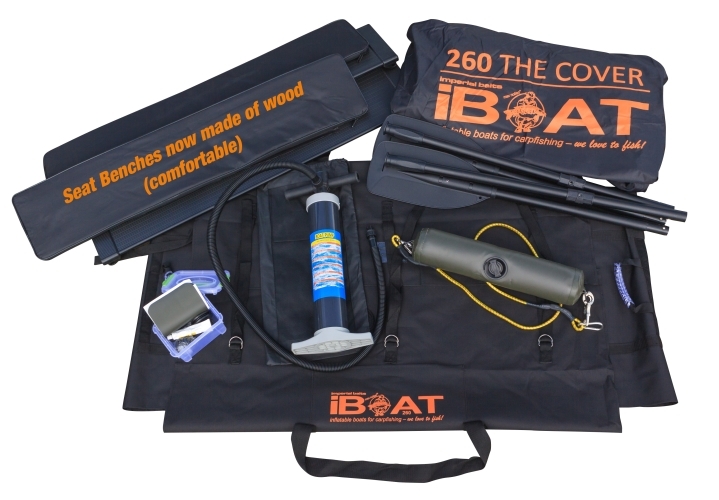 Also in our rubber boat comparison they had the highest score and the newest version of iboats, the iboat 2.0, is furnished with another innovation: oarlock with metal roller- unbreakable. The iboats are real carp fisher boats; it is about time to pay attention to them!" The choice of rubber boats is huge. This gave the redaction team of Carpzilla the challenge to compare the actual boats. 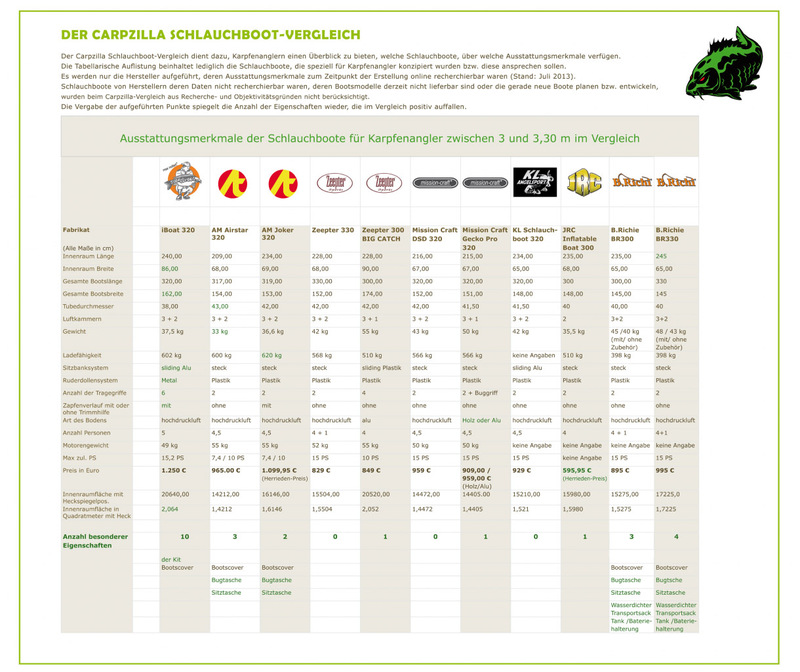 Carpzilla gives you a nice review- which boat is he right one for you?